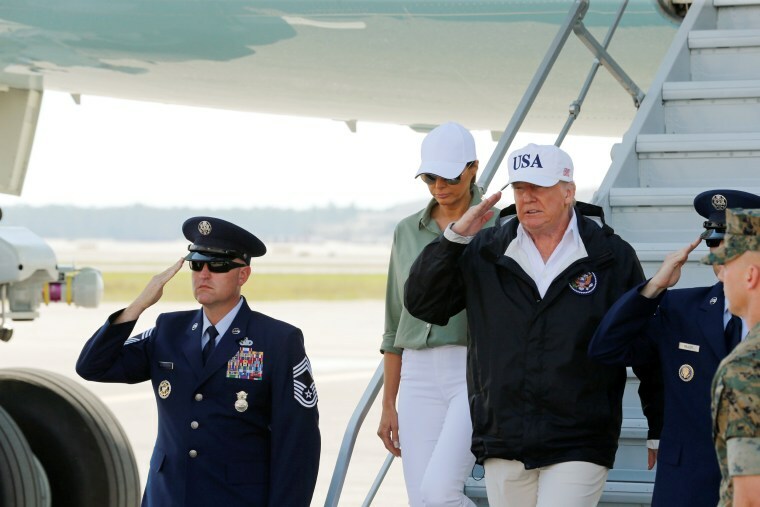 President Donald Trump touched down in Florida Thursday to highlight and praise Hurricane Irma recovery efforts in the state he's called a "second home." Greeting storm victims in Naples, Trump offered "100 percent" support to the people of Florida, calling them "special, special people and we love them." "They went through something the likes of which...nobody's ever seen before," Trump told reporters before moving on to tour Irma damage and help distribute lunches to those impacted by the storm. As he did in Texas after Hurricane Harvey, Trump extolled the recovery efforts, saying of that work in Florida that "the job everybody's done in terms of first responder and everybody, has been incredible." Upon landing in Ft. Myers, just north of Naples, Trump spoke with reporters about discussions on DACA that he had with Democrats in Washington the night before. The talks focused on a potential deal for Dreamers — young undocumented immigrants who came to the U.S. as kids and were offered protection from deportation under the Obama-era "Deferred Action for Childhood Arrivals" policy. However, that deal could leave in limbo Trump's long-promised wall on the southern border. To Trump, the wall may not come in this potential deal, but he said an "understanding" about the wall in the future was paramount to getting a deal done. "We have to have an understanding," the president said, "that the wall will be funded. Otherwise we're not doing any deal." "If we don't have the wall," he added, "we're doing nothing." Trump also expressed a desire to work in a bipartisan fashion before heading out to survey damage from Hurricane Irma. "Now, let's go and see how we're doing, because I think we're doing a good job in Florida," he said. "I hope this man right here, Rick Scott, runs for the Senate," Trump said. It was the first time the president had offered such encouragement, though Trump acknowledged Thursday, "I don't know what he's going to do." In a rare move, Trump also thanked the media. "We appreciate you being so understanding," he said. "It's been a tough time, even for you folks." Fort Myers and Naples were among the cities hit hard by Irma, which made landfall in the state Sunday morning as a dangerous Category 4 storm. By Monday, the hurricane-turned-tropical storm had weakened to a tropical depression. Am leaving now for Florida to see our GREAT first responders and to thank the U.S. Coast Guard, FEMA etc. A real disaster, much work to do! Trump's Florida visit on Thursday was his third to a hurricane-ravaged region in three weeks, after two stops in Texas to survey damage from Hurricane Harvey.